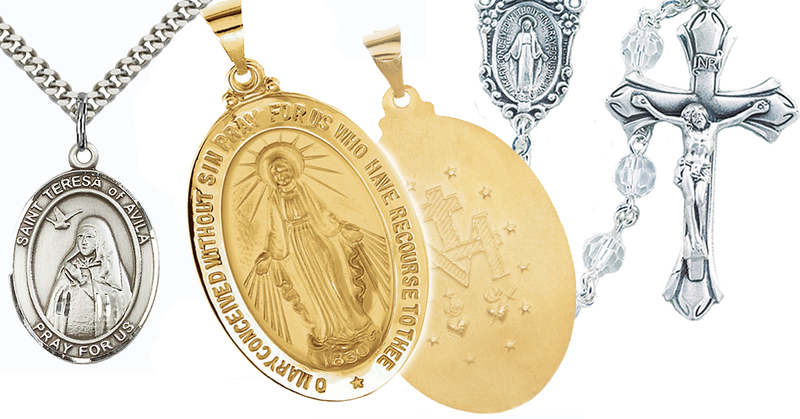 At CatholicShop.com, we carry a huge inventory of medals, pins, rosaries and much more! We're often asked how the sizes of our medals and pendants compare to each other and how to distinguish between standard and metric sizes. 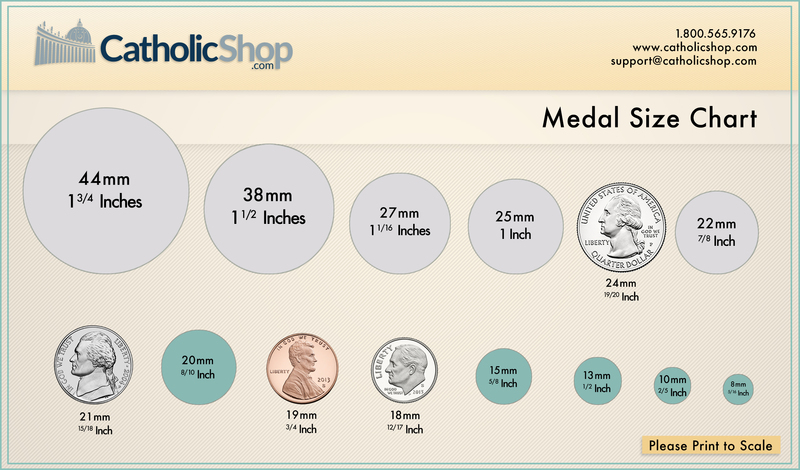 For your convenience, please use the chart below to determine the size of our medals. Gold: Because of the softness of pure (24 karat) gold, most jewelry is made from 14 karat gold, and sometimes 18 karat gold. If a piece of jewelry on our website is listed as 14K Gold or similar, than you will know it is solid 14K gold, not gold-plated or gold-filled. Sterling Silver is an alloy of silver containing 92.5 by weight of silver and 7.5 by weight of other metals, usually copper. Fine silver, for example 99.9% pure silver, is generally too soft for producing functional objects; therefore, our silver jewelry is made of Sterling Silver. Gold-Filled is an actual layer of gold that is pressure bonded to another metal. Gold filled is not to be confused with gold plating as gold-filled literally has 100% more gold than gold plating. Gold-filled is much more valuable and tarnish resistant. It does not flake off, rub off or turn colors. Rhodium is a rare, silvery-white, hard member of the platinum group. Naturally occurring rhodium is one of the rarest and most valuable precious metals. Rhodium is a noble metal, resistant to corrosion, found in platinum or nickel ores together with the other members of the platinum group metals.